A 2-year-old child with cerebral palsy was brought to the outpatient department by anxious parents with complaints of child not responding to any visual stimuli. The child had apparently normal looking eyes, but he was not perceiving any visual stimuli. This is often the problem in children with cerebral visual impairment (CVI). Hence, CVI remains one of the important causes of visual impairment today and it is going to remain that way for a long time to come. Visual impairment is of two types – one is based on the structural problems in the eye  (cataract, corneal opacity, etc.) and the other one is based on the issues in the brain (disorders affecting the visual pathway). CVI is due to damage in the visual pathway. It was previously termed as cortical visual impairment. The eye perceives the image of the object and the brain receives the imagery, but it cannot sort out the image that it has received. The two cortical visual pathways (dorsal and ventral stream) though not as distinct as originally proposed contribute to the perception of an image. The dorsal visual stream contributes to “where/how” perception and the ventral visual stream contributes to “what” perception of the imagery. There can be an overlap in the functions of the visual streams and may not be distinctly defined as originally proposed. Hence, cortical blindness cannot be fixed with glasses alone. The visual system needs to be stimulated to help in recognizing the perceived imagery. What can cause a CVI? Many people attribute prematurity to CVI, but that is not primarily the cause. Complications that can happen because of prematurity such as hemorrhage, infarct and periventricular leukomalacia can be a cause of CVI. A difficult labor which can predispose to hypoxia or ischemic damage of the brain, developmental anomalies of the neurological systems, seizures, head injury, chromosomal disorders which affect the brain, metabolic disorders such as hypoglycemia or electrolyte imbalances, accumulation of cerebrospinal fluid (hydrocephalus), and viral infections leading to meningitis can all lead to CVI. The child needs to be assessed by a neurologist first, followed by inputs from a pediatrician and an occupational therapist and thereafter referred to an ophthalmologist for an eye evaluation [Figure 1]. Structural problems of the eye, misaligned eyes, and refractive error should be first ruled out. The child needs to be given glasses  or a corrective eye muscle surgery  should be performed to maximize visual function. They need to be functionally assessed for color preferences, level of vision loss associated with any fluctuations, delay in the response to visual stimuli, the degree of difficulty in visualizing new surroundings or objects, any preference for viewing at close range, or better viewing of moving objects as compared to stationary objects [Figure 2]. Children need to be assessed functionally for characteristic behavior pattern [Figure 3]. The child with CVI may not look at black and white striped cards often used to assess infant vision, but they may be responsive to something that they may be familiar with like a red toy used by them at home. They may not look at white light but responsive to red light. They pay attention to movement. Their dorsal stream vision pays attention to movement. Showing a moving toy like a red pinwheel or a shiny toy will elicit a response. They have delayed response; they may take a little longer to respond to stimuli. Hence, while moving a colorful green object from left to right, they may take a while to track it. Complexity addresses the ventral stream of vision or the “What” system. Children with CVI cannot make sense of things that have lots of patterns. When objects are kept against a patterned background, they get lost. To illustrate complexity, toys have been placed against a background of black and white checks. Toys such as yellow duck or red car can be distinguished, but it is difficult to view a black and white cow, killer whale, and pinto pony against such a background. They cannot sort out complex information. Damage to optic radiation may affect visual field. Lower visual defects are common. We have to assess their preferred fields to elicit a response to stimuli. Normal children are activated toward visual novelty, but CVI children consider it as visual noise as they cannot sort out the mess of pattern and object clutter. They do not blink to a visual threat or when you touch them at the bridge of the nose. An improvement in reflexes is an improvement in functional vision. They have difficulty in viewing things as they are moved far across the room. They respond or gaze at bright light unlike normal infants who close their eyes defensively at bright light. Integration of dorsal and ventral visual stream does not happen. Looking and reaching out of objects at the same time may not happen. A history of neurologic issues, characteristics associated with CVI, and eye examination that does not correlate with the way a child sees all aid in the diagnosis. Visual evoked potential is not useful in predicting the way a child is going to perceive. Magnetic resonance imaging (MRI) is definitely useful in terms of understanding what has happened in the brain such as hemorrhages, infarcts, and leukomalacia. Dutton and Bax has established clinical and MRI criteria for referral of patients for therapeutic intervention. CVI range is a stable tool to evaluate functional vision. It is used to detect the degree of the effect of CVI on a 0–10 scale [Figure 3]. Somebody with a score of 2 has very low visual perception as against to 10. May localize briefly, but generally no appropriate attention to objects. Visually fixates when the environment is controlled. Range 5–6: Student uses vision for functional tasks. Object viewed may have 2–3 colors. Selection of toys is less restricted. 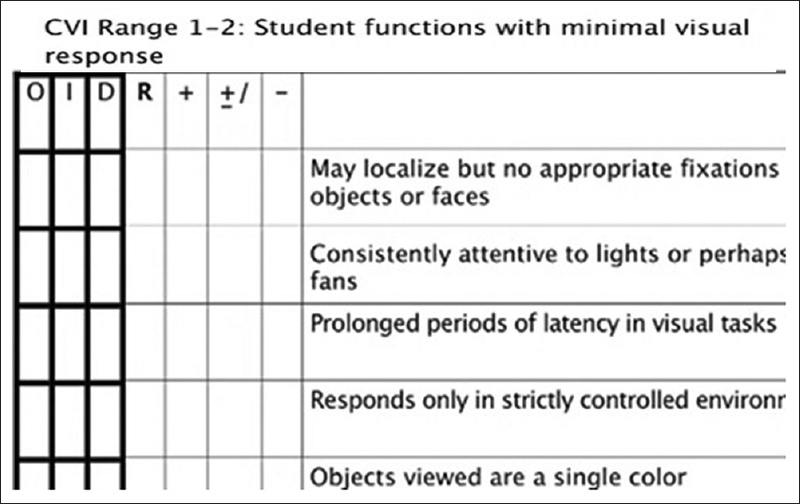 Rage 9–10: Student spontaneously used vision for most functional activities. Selection of toys not restricted. After the CVI range is determined, the child should be treated for improvement. All children with different ranges of impairment make significant progress. Visual stimulations should be tailored according to the needs of the child – large high contrast moving objects to stimulate the eye, touch or sound stimulus to attract the child's attention, presentation of visual materials at different directions as there may be field objects in viewing objects, variable levels of light in the environment to be used (lighted toy in a dim room), extra time to be given to the child to respond to visual stimuli, avoidance of overstimulation as this may lead to fatigue, and visual stimulation in a simple uncluttered manner with increasing complexity as the child's development progresses are some of the ways of improving the child's visual development. Ajina S, Bridge H. Subcortical pathways to extrastriate visual cortex underlie residual vision following bilateral damage to V1. Neuropsychologia 2018; pii: S0028-3932(18)30006-X. Zachariou V, Klatzky R, Behrmann M. Ventral and dorsal visual stream contributions to the perception of object shape and object location. J Cogn Neurosci 2014;26:189-209. Bhattarai D, Gnyawali S, Silwal A, Puri S, Shrestha A, Kunwar MB, et al. Student-led screening of school children for refractive error correction. Ophthalmic Epidemiol 2018;25:133-9. 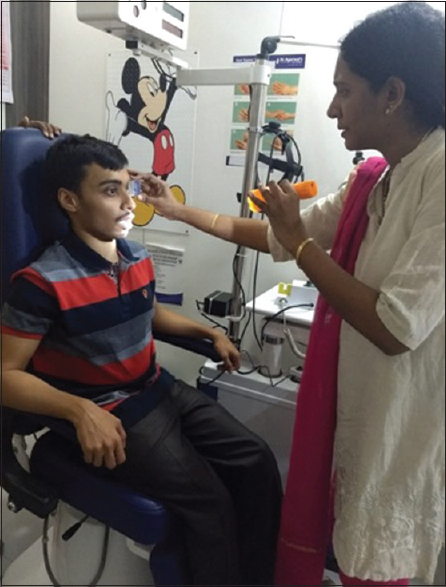 Philip SS, Tsherlinga S, Thomas MM, Dutton GN, Bowman R. A validation of an examination protocol for cerebral visual impairment among children in a clinical population in India. J Clin Diagn Res 2016;10:NC01-4. 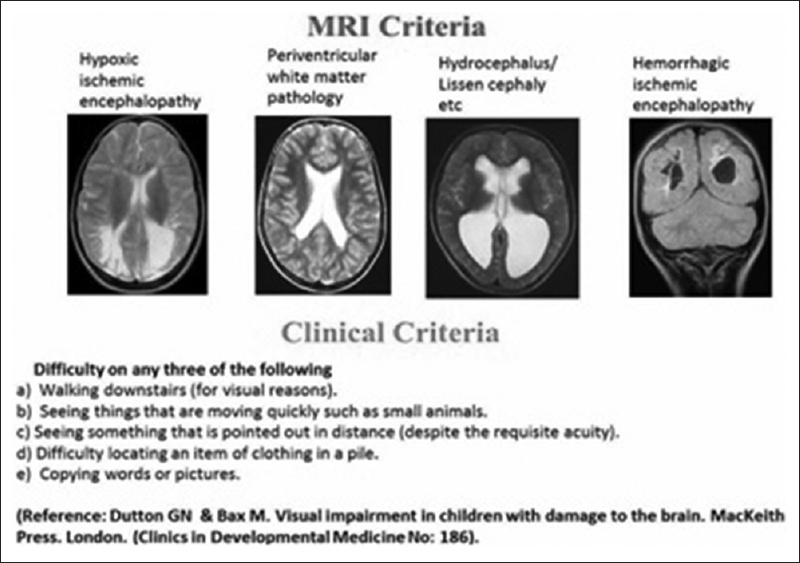 Dutton GN, Bax M. Visual Impairment in Children with Damage to Brain. Clinics in Developmental Medicine No. 186. London: McKeith Press;2010. Jeon H, Jung J, Choi H. Long-term surgical outcomes of early surgery for intermittent exotropia in children less than 4 years of age. Curr Eye Res 2017;42:1435-9. Philip SS. Setting up of a cerebral visual impairment clinic for children: Challenges and future developments. Indian J Ophthalmol 2017;65:30-4. Meyniel C, Bodaghi B, Robert PY. Revisiting vision rehabilitation. Front Syst Neurosci 2017;11:82.